They keep us up at night. People expect us to solve them. What are your Complex Issues? Why does it matter that we can identify Complex Issues? Most importantly, the shape of leadership for Complex Issues is different that it is for Routine Issues. 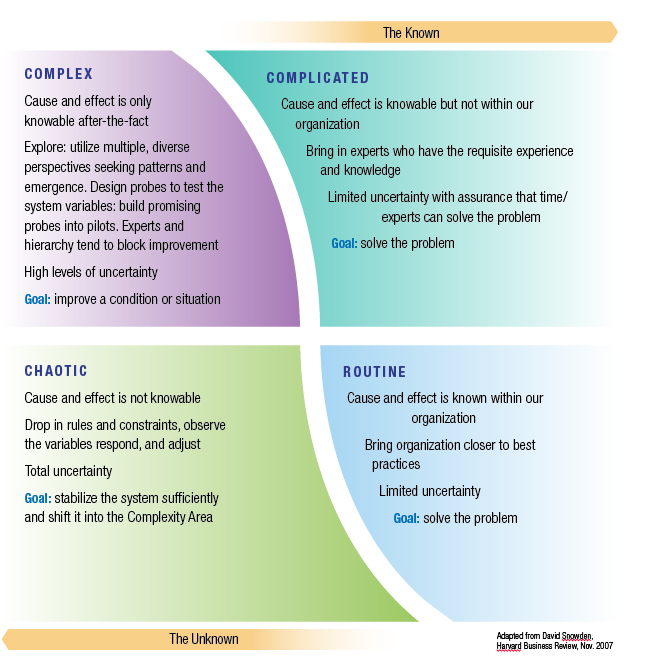 The Chart below elaborates how we can categorize Issues to identify the type of leadership that is optimal. In using Systemic and Critical Thinking approaches, we find that they enhance our capacity to work with Complex Issues. Systemic methods are likely over-kill when a Routine Issue faces the organization; in Routine Issues, cause and effect among the key variables is known. However, in a Complex Issue, we don’t know if A is causing B, and thus we have to enter into an effective broad exploration of the possible variables and identify patterns, where we can, that indicate association and causation. Then we can design probes to test the systems, and from this information, we can build pilot programs. Systemic methods require a highly diverse group of participants; they are both highly time-efficient and the participants enjoy sharing their knowledge. The leadership can explore many new emergent ideas, and build on choices and thinking that was previously buried within the organization.